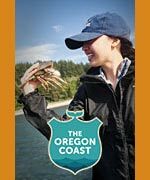 (Oregon Coast) â€“ One of the more distinct (and surreal) pleasures of hitting the beaches of Oregon is when you find just the right combination of a seamless blend of sea, sky and sand. It's not simply that the sky is reflected in a wet beach â€“ although that's the basics you need to get such dreamlike drama. It's the awe-inspiring gigantic-ness of it. The sheer size of the sky in the sand, on such a scale that it's a tad disorienting. One of the pleasures of this coastline is looking down and for a fleeting moment it feels as if you may actually just walk into the sky. It's a wild, head-spinning sensation where it seems you may step onto clouds. Like the shots above and below, taken in Manzanita. It's mid December on the north Oregon coast, and Manzanita is surprisingly not as chilly as you'd think. In fact, the ocean has a moderating influence on the region, keeping the beach towns actually warmer than inland towns in winter much of the time. A bit unusual are these fat, puffy clouds, however, which tend to happen more in spring than any other time of year. These allow the sun to bounce off them and cut through them in fascinating ways you don't get with other kinds of weather. Couple that with wet sand, and you have a striking, surreal landscape. Cannon Beach in November of 2012. At the southern end of town, beyond the Tolovana district, sit a few engaging rock structures by the tideline. Look for awesome tide pool colonies here. On this particular evening, the reflective sand and sunset are joined by the moon to form this web-like shape. The tiny white dot in the distance is a fishing boat. On a dreary, gray November day in Lincoln City, sunset make a sudden, surprise appearance. But not just any sunset. The tiny break in the clouds is cause for a gauzy haze that only allows a certain kind of pink through. In this spot, close to Inn at Spanish Head, you also almost feel as if walking on the sand will cause you to fall updwards â€“ were it not for that big, foamy wave. 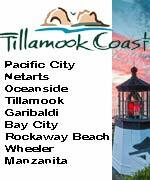 Closer to Lincoln City's Road's End area, this central Oregon coast hotspot is suddenly cause for a doubletake. 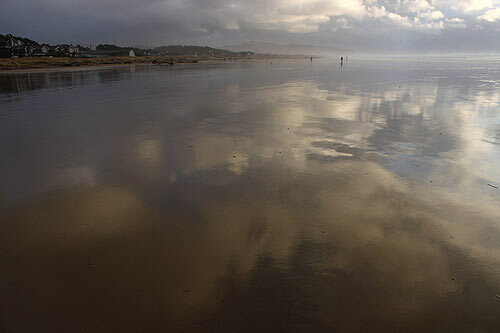 The sky is even more dramatic when mirrored in sand. At Seaside's absolute northern edge, near the Necanicum River, you can find more whole sand dollars than anywhere else on the Oregon coast. This one, simply lying in a rivulet-covered sand, seems to be reaching for the sky reflected in front of it. Between Florence and Yachats sits Neptune State Park, where one summer's day ends with wild, fiery colors and a scene that's slightly mind-bending. What helps to make dreamy situations and sights like this is that you have a long stretch of flat beach that meets the ocean, which this place often is.